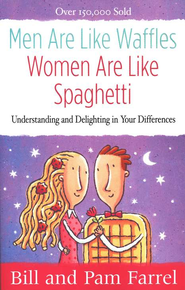 There is a great book out there for marriage called, Men are Like Waffles, Women are Like Spaghetti. Men see things in compartments and have the ability to hyper-focus on one thing, while women can be like spaghetti and work on many things with all of it intertwined and connecting. Women go to work and conduct meetings while thinking about the last conversation she had with her child, making a grocery list, and organizing the rest of the work day–all at once. Men go to work. It’s the same thing in intimacy. Women tend to have a racing mind and need lots of settle down time to focus on intimacy. Men can instantly and with ease forget it all and concentrate on the moment. Yesterday I was talking to the cutest couple ever– alive in their love, happy, successful and we got to sharing about daily tasks. The infamous, “Why can’t he just read my mind?” question came up with daily tasks. Make a list! It’s worth it. The husband noted a list would be a lot better than the old western scene of the sheriff shooting his gun at the outlaw’s feet to watch him dance. We all laughed! A list of things to do literally puts everyone on the same page. We recently sat down as a family and had the overall weekly list placed on the frig. Monday we clean this room. So and so is responsible for this chore. However, weekends bring new lists because we are all so busy. Make it fun! Sit down over coffee and eggs and talk about the goals for the day and plan it like a vacation. I’ve often conveyed to our family that God has given us a beautiful home and life, and we can give back to Him a huge THANK YOU by taking care of the things He has given us. The other choice is an angry attitude and an ungrateful heart, which, I confess, I’ve had on many occasions. I don’t have a clean house all the time. 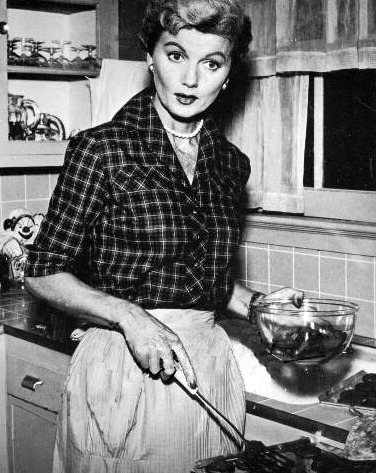 I’m not June Cleaver. I call my spaghetti-waffle life an adventure of ups and downs and figure things out day-to-day. Over the years I’ve tried hard to keep expectations realistic for myself and my mate, enjoy the moment and take time to laugh, eat cereal for dinner, be okay with baskets of clothes not put away, and most importantly it’s okay to make a list! Husbands, if your wife gives you a list the true test is your attitude and spirit. If you complain that you can’t read her mind, but get puffed up when you see the list, then perhaps a serious look at what’s really going on in the communication area is needed. God calls men to love and honor their wives as Christ loves the church. How can you honor your wife today? Wives, make a realistic list, and don’t give it to him while he is in the shower, or taped to his forehead while sleeping. The best way is to sit and talk about the day; however, we have been so busy in our lives that I’ve made a time agenda with a list and posted it like a camp schedule. I always include the children too. They have capable hands to help around the house. We are different by design–embrace and celebrate the differences! Spaghetti women are great at seeing the big picture, intertwined, and can make lists! Men are awesome at hyper-focus and can do one step at a time on the list! What a gift we have in our men! Parish yesterday hyper-focused on a major item that brought great success, fun, and love to his mother’s surprise birthday party. He made the best chocolate fountain ever while I took care of other things around the house and gathered all the necessary items for the party. I watched his brother, John, support his wife in the same way–working hard to make food and clean after the party while his wife was leading and hosting. It’s a partnership filled with joy if we learn to communicate and not be the sheriff shooting at each other’s feet!